Complete an open-space design with this console bathroom vanity. 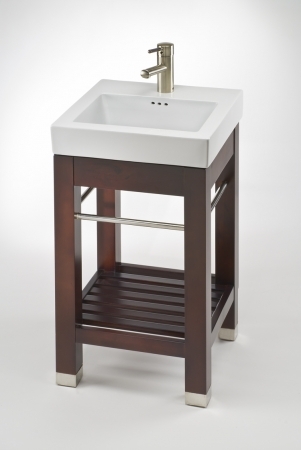 Efficient design provides a large, square sink with shelf space for linens or baskets. Chrome bars offer a modern look or a place to hang towels. Unit requires some assembly, but offers an easy and classy look for small bathrooms. 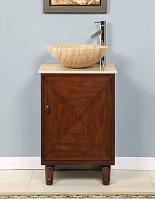 Additional Sizes: Also available in 17.9 Inch Single Sink Bath Vanity, 24 Inch Single Sink Bath Vanity. 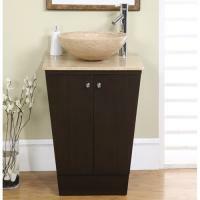 Material: This bath vanity is constructed of solid wood post & frame using Birch and or Alder. Birch is a tree that is found all over the country and can be recognized by its white bark. It is similar to the Aspen species. Birch lumber for solid stock is a smooth tight grained wood, usually light with a hint of red in its natural color. Works very smooth and is a great choice for cabinet building, both painted and stained. Solid Alder has become one of the most desired wood species for building cabinets and furniture because of its price and physical characteristics. Solid Alder tends to have a lot of knots and natural defects that people like because of its added character. Alder is naturally medium brown in color and is a relatively easy wood to work with because of its tight grain. All hardwoods have been Kiln dried to ensure a stable product that will not expand, contract, or warp. I had this vanity installed in a remodeled small bathroom about 3 weeks ago and am extremely pleased with this item. The wood is a beautiful color and the sink is just the right size. Since the sides of the sink are almost vertical, it tends to stay cleaner longer than a round bowl. The brown and white combination beautifully complement my white subway tile and colored glass mosaic accent tiles. I have received many compliments on my new sink/vanity combination and am invariably asked where it was purchased. I am so pleased with my vanity and Unique Vanities has offered excellent customer service as well. The vanity and sink are absolutely beautiful. One of the towel racks has some discoloration (looks like rust). As it is up against the tub and no one will see it, I just let it go. My contractor cannot wait for a new one, and it just seems like too much trouble to return. Samantha from customer service did ask that I email a picture, but I'm tool old to know how to do that! If the towel bar would have been perfect, I would have given it a 5 star plus rating. When remodeling our very small bathroom, we quickly learned that our options for an 18-20" vanity where extremely limited. We found a great vanity at Unique Vanities, that fit our budget, style, and limeted dimensions. The product quality and customer service has been exceptional (and free shipping to boot!!) We will recommended your site to friends as well as our contractor! I don't believe that my wife and I could have been more pleased, with respect to our dealings with UniqueVanities.com and the product! The product actually looked better in our powder room, than it appeared in the website photo. Their customer service exceeds excellent! We would not hesitate to use this site for any additional needs we would have in the future. Everthing about this Vanity works perfectly in this small bathroom setting. The fit and finish are terrific and the size helps make the room look larger than it is. My wife was able to play of the dark wood finish with decorative accents around the rest of the room. We just ordered this vanity for our new home. Finding a stylish smaller size was a challenge and this fit the bill perfectly. I am very impressed with the customer services that has been provided from order entry, delivery info and a follow up thank you. Well, I just got my vanity home and it is beautiful!!!! Fits perfectly in my tiny bathroom. Dealing with this company has been a pleasure! Will definitely recommend. Haven't installed this vanity yet, but it arrived quickly, and looks exactly like the picture. I have a small bathroom, and this vanity is the perfect size. Purchase and delivery process could not have been easier. Vanity is beautiful. Looks even better than the picture online. Excelllent customer service. The bathroom vanity arrived intact and looks great! Oustanding service and quality! Thank you. P.S. I appreciated the soap and towel.